As previously featured on Elephant Journal. I had been warned that I would experience reverse culture-shock upon returning from Bali, one of the 17,000 islands of Indonesia. I have a little bit of first-hand experience with this concept, having spent my junior year of college living abroad in Spain. When I returned back to the United States and then to a small, rural college town in New England, I felt like I had landed on a different planet. I had gone from a diverse and international community in the midst of a pulsating urban center with a rich cultural and artistic history, to being in the middle of farmland in one of the least diverse states in the nation. So yes, I knew all about reverse culture-shock. But I was only going to Bali on a two-week yoga retreat; surely that was not enough time to experience any kind of culture shock upon my return. I was not worried. I guess I should have heeded the warning. After the 24 or so hour journey home from Denpasar, we landed in San Francisco late on a Sunday night. My body had no idea what time it was; it didn’t know if it should eat, sleep, or go for a walk! It happened to be just before midnight on what would be the 4th of July, a surreal time to be arriving back home from my first ever trip to Asia. As we drove into the city, headed down the Octavia St. ramp and then made the turn onto Fell St., I was very aware of the fact that I was experiencing the exact same sensation I had had when I found my feet back on the rural earth of New England, all of those years prior; I felt like I had entered the twilight zone. San Francisco is a very vibrant and lively city, full of energy, and as the city was teeming with tourists for the 4th of July festivities, one would imagine it being even more so; and to the average bystander it probably felt exactly that: alive. But to me that night it felt like a dead zone. As we drove past the dark and austere buildings of brick and wood, the city seemed almost depressed to me. Why did it all of a sudden look so different to me? Bali had provided a stark contrast. The island is famous for being a “spiritually elevated” place with some of the world’s most happy and smiling inhabitants. And that description couldn’t have proved more true. In Bali the idea of community is one of their most important themes. Within a particular village, all of the men are required to join what is called a “Banjar”, essentially the Balinese equivalent of a community organization. The Banjar meets weekly to discuss and decide on issues that impact everyone in the village; such as when to fix a road, rebuild a side-walk or whether or not to allow a bar to open. The men of the village take their Banjar responsibilities very seriously and any men that neglect their Banjar duties are fined accordingly. In addition to the Banjar, the rest of the villagers are heavily involved in their communities as well. They all work together to organize and perform in local, traditional dance performances, which take place often on a daily basis. They help one another out in times of need. If someone’s house catches fire, you will see the entire community grabbing buckets of water and running to the scene to help. The community also comes together in times of ritual and celebration. In Balinese Hinduism, the highest honor that a person can receive is to have a cremation ceremony. When it comes time for this elaborate and beautiful ceremony, the entire community will come together to assist with the building of the cremation tower and to celebrate the life and right of passage of the deceased. Balinese life very much takes place in the streets. You see the happy Balinese people out and about (amidst the dogs and hundreds of chickens!) walking, talking to one another, welcoming tourists. And everywhere you look you will see smiles, wider ear to ear smiles than I have ever seen. You see men and women alike bringing their sacred offerings to their Temples, multiple times a day; all to honor and appease the Deities in order to bring blessings upon their village, and the citizens within the village. Community is everything in Bali. So imagine I come home to a society where it is rare for anybody to talk to their neighbors (unless you have a complaint! ), where we spend much of our time isolated either in our homes or in our cars, or in our offices working like dogs, and where if you regularly smile at strangers who pass you on the street, you will more likely than not be taken for a crazy person! This city that had once felt so alive and energized to me, now felt very cold and harsh…and concrete. What shocked me most of all was the number of homeless people in San Francisco. Knowing that I live in a city with one of the highest populations of homeless people in the country, this should not come as a surprise to me. I see it everyday, day and night, no matter where I go. But the reason that this was suddenly so glaring to me is that in Bali I saw none. Here I was in what the US would consider a “Third Word Country” and I did not see a single person sleeping on the streets or pan-handling. How could this be? I’ve traveled to plenty of Third and even Second and First world countries and seen ample and visible homelessness. So how is it that on this island of nearly four million people, I didn’t see any? The answer is the “family compound”. Anyone who knows me personally knows that this term has a funny, personal connotation to me. You see, my dad comes from a large Italian family, and because several of the siblings built their houses on the same plot of land, side by side and back to back to one another, they have created what we in my family call the “compound”. Well, it seems that my Italian relatives may have been onto something. In Bali, everyone lives in what they call a “family compound”. The oldest brother is the head of the compound, the wives then follow their husbands to their family compounds, and then the grandparents, aunts, uncles, and grandchildren all live together, all working together to support the family compound and its members. So you see, it would be really difficult to become homeless in Bali, because even if a member of the family finds themselves jobless or down and out, because they live in the family compound, they are supported by the rest of the family. 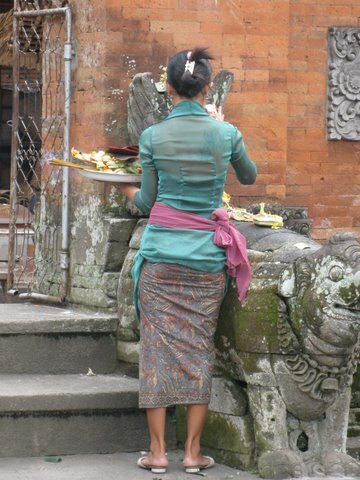 Very simply put, the Balinese take care of their own. So to come home to San Francisco, where on any given day I can see 10-20 people, without homes, without any way to wash themselves, pushing around all of their Wordly possessions in their grocery carts, wondering where they will find their next meal; was a sobering experience to say the least. I found myself wondering how this can be in the richest country in the world when a “Third World” island like Bali has no such problem. Another element of Balinese society that stood out to me is the way they care for their elderly. They remain in the family compound, as the family elders to impart their wisdom on the grandchildren, and they are very much involved with the day to day functions of the family unit: cooking meals, making offerings, contributing to any family artisanship (ex. mask-making, puppet-making, etc). I came back to America thinking about the fact that we so often put our elderly in nursing homes, that we essentially pawn them off on someone else to take care of them. Now I recognize that this has just become somewhat of a norm in our society and that many people do it out of necessity, and certainly not out of any lack of love. I know it is a horrible decision for many people to have to make. But when I saw this very distinct society that has found a much more humane way to take care of their elders, through the family compound, it simply seemed barbaric to me that our society has developed in the way that it has. The last aspect of Balinese society that really struck me as beautiful and contrasting to our own was their devotion; their devotion to Earth and Spirit equally. When Hinduism came to Indonesia from India, as early as the first Century, it mixed with the animist religions that already existed on the Indonesian archipelago, forming a unique brand of Hinduism, which today remains only on the island of Bali. Animism encompasses the belief that there is no separation between the spiritual and physical worlds, and that spirits exist not only in humans, but also in all other animals, plants and all other parts of nature. The Balinese people very much live off of the land, and because of this belief that we, the Earth and everything on it, are all part of Spirit, they have a deep respect and reverence for all parts of nature. Being an agrarian society, with rice being the most important crop, the Balinese take special care to nurture their fields. They understand that if they disrespect the land, that it will cause everything and everyone to be out of balance. For that reason they spend pain-staking amounts of time and energy to honor their Deities, the Gods of the sky, the Gods of the rice, etc, by making beautiful little baskets of offerings. 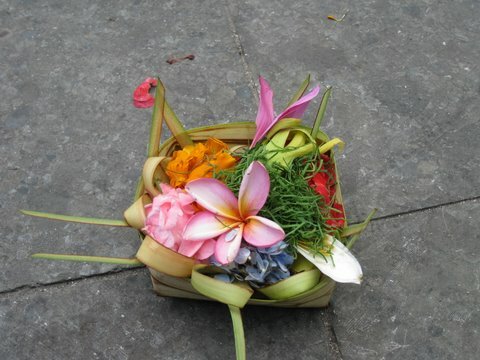 To walk about Bali is to see hundreds of offerings, everywhere. You will see them on cars, in front of storefronts, in restaurants, at Temple gates, and on sidewalks. As a tourist you really have to watch your step to not step on them as you go. Multiple times a day you see men and women alike coming out in their lovely sarongs and Temple scarves, to leave a beautiful offering at a Temple. When is the last time any of us went outside and thanked the land for providing us with our food and water? What does our society do to stay in balance with Earth and Spirit? I’ll let you answer that for yourselves. I have my own thoughts on the matter. But I do know that many of our own Native American tribes do this. The society that I have described above is very similar to Shamanic societies all around the world. I have studied much on this favorite topic of mine, as it is something from which I believe we can learn great lessons. I am intrigued by how native societies all over the world, thousands of miles apart, have developed very similar rituals and ways of living that honor the Spirits around them, the Spirits of Earth and Sky. If I can apply a pop-culture reference, if any of you have seen “Avatar”, then perhaps you know what I’m talking about. That film was poignantly timed and did a powerful job of illustrating the beauty and wisdom of a Shamanic society, of the importance of respecting, honoring and integrating with the land around us. Picture the scenes in “Avatar” and you can pretty much picture Bali. So what is my point? Am I saying that Bali is a better place to live than America? Bali is a beautiful, magical, spiritually “elevated” place, that is absolutely true. And would I accept an invitation to live there, even if only for a while? You better believe it! But I am not saying that any one place is better to live than the other, and I have to state that because I know that there will be people who read this and make that mistake. I definitely recognize the wonderful things about the United States (as I did after my adjustment home from Spain as well), but the beautiful thing about travel is that it gives you perspective, perspective to see what is good about one’s society and what we have to be thankful for; but it also provides us with the perspective to see what is not so good about our own societies, what can be improved upon and where we have room to grow as a people. I believe the true definition of a Patriot is someone who is not so arrogant to believe that they are better than everyone else, but rather is humble enough to know that he can learn from other people, other cultures. And while a country that still performs animal sacrifice, a country that does not use toilet paper and a country where offerings are made to appease the Gods, would most often be considered “primitive” by the Western world, instead I would argue that it has a lot to teach us. The real question is, are we humble enough to learn?